Several dosages of a single coagulant are used to determine the target dose for the application. The test uses NTU and UV254 as factors when considering the target dosage. 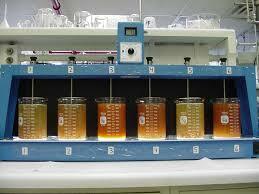 Samples are flash mixed and allowed to settle, and then the supernatant is used for analysis. Information from this test can be used to size chemical makeup skid and accessories. Test Report with the findings and sizing recommendations.